A few months ago, a little picture caught my eye. 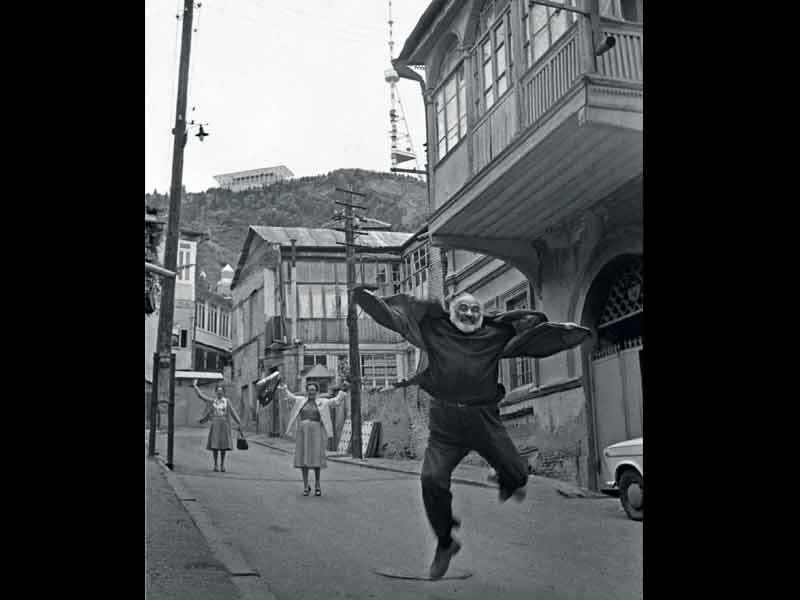 Framed on the white wall of a London Georgian restaurant, it was a small black and white photograph: an old, bearded man leapt through the air, his jacket gathered around his arms like a pair of wings. A couple of women stood behind him, hands raised, their stance somewhere between amusement and bemusement. There was something mysteriously arresting about that picture and I couldn’t help but feel intrigued. A couple of months on and a major BFI Southbank retrospective later, I now recognise the soaring figure as Sergei Paradjanov (1924-1990) – a singularly spectacular creator of images. In this case, it was his own vivacious portrait; within his films, an infinite series of majestically beautiful tableaux. The rich red of a pomegranate seeping into white linen; an ornate royal hunting party seated on bold black horses, raising their pistols to the sky; a handsomely beautiful woman, bedecked in a wreath like Caravaggio’s Bacchus, her shoulder covered by a plump white cockerel. Despite citing Tarkovsky, Pasolini and Fellini as influences, Paradjanov’s aesthetic is not quite like anything else in cinema. Screening before several features at the BFI retrospective, Kiev Frescoes (1965) perfectly demonstrated the potency of his mysterious visions. This film collage is a 13-minute compilation of rushes and tests from a feature, banned in pre-production by the Soviet authorities. Incomplete and fragmented, these scenes might have left the viewer confused and searching for meaning. But despite a lack of context or narrative, the viewer could not help but yield to the image of three immaculately attired military men perched on stools, sceptres in hands, or the sound of luscious water sweeping over floorboards. It was an exceedingly powerful initiation into Paradjanov’s oeuvre: works that delight and indulge in the aural and visual possibilities of film. Paradjanov studied film at the Moscow Film School, VGIK, but his concept of the filmmaker was founded much more on his own romantic sensibility than on a formal education: ‘You torment others with your artistic delight,’ he said in the documentary Paradjanov: A Requiem (1994). ‘You can’t learn [filmmaking]. You have to possess it in your mother’s womb.’ After making several features and documentaries in the 1950s, Paradjanov took a new direction after seeing Andrei Tarkovsky’s debut feature, Ivan’s Childhood (1962). Taking Tarkovsky to be his ‘mentor’, he rejected Soviet social realism as ‘submissive works by court artists’ and embarked on Shadows of Our Forgotten Ancestors (1964), a Ukrainian folkloric tale filmed in the Gutsul dialect. His break from social realism and championing of the Ukraine region (he categorically refused to dub the film into Russian) prompted much hostility from the Soviet government. He was blacklisted and imprisoned three times on various trumped-up charges. Although Shadows of Our Forgotten Ancestors resulted in personal suffering, it was a revelatory moment for Paradjanov, both in terms of style and content, as he explained in Paradjanov: A Requiem: ‘That’s when I found my theme – the struggles of a people. I focused on ethnography, on God, love and tragedy. That’s what film and literature are to me’. These were themes that Paradjanov would pursue in what many consider to be his ultimate masterpiece, The Colour of Pomegranates (1967). Screening after the short Kiev Frescoes, it was this film that was chosen as the main feature to launch the retrospective. It may have made more sense to open with Shadows of Our Forgotten Ancestors, since it was this project that marked Paradjanov’s adventurous new approach to filmmaking and, of the two, The Colour of Pomegranates is the more accomplished, complete film. Shadows of our Forgotten Ancestors is a truly extraordinary film in itself but it loses a little pacing in the final scenes and cannot quite compete with the tender beauty of The Colour of Pomegranates. From a chronological perspective, it would have been beneficial for BFI audiences to see such career progression through the programming. It seems likely that the decision was based on the fact that The Colours of Pomegranates is Paradjanov’s best known film. Sadly, Paradjanov does not enjoy the reputation he deserves – I’m sure many people have sat in the same Georgian restaurant and not known the identity of the man in the photograph. The BFI season was the first-ever opportunity to see his shorts, features, documentaries and unfinished projects all gathered together and it was encouraging to see screenings sold out to engrossed audiences. From the career-spanning material presented at BFI Southbank, it is clear that he is a director who must be considered one of the masters of cinema. Although the positioning of The Colour of Pomegranates was questionable in terms of chronology, it proved an ideal choice in terms of impact. It is as revelatory a film as Ivan’s Childhood. Inspired by Armenian miniatures and icons, its tableaux slowly evoke – rather than tell – the life of the 18th-century poet and troubadour Sayat Nova. Because of its impressionistic, allegorical approach, many have described the film as non-narrative, but it is, in fact, fairly linear in its storytelling. We see the young poet growing up in a simple, wool-farming community; his time as bard at the court of King Erekle II; his desire for the king’s sister; the loss of this love; his retreat to monastic life; his grief over the death of his mentor, Father Lazarus; and in turn, his own old age and death. As the troubadour moves towards death, his former muse and childhood self appear among the compositions as he looks back on his life – ‘In the Sun Valley of the distant years, live my longings, my loves and my childhood’ – but the film tends to move forward with few flashbacks. It is more that the linearity becomes lost among the rich symbolism and surrealist touches. As Sayat Nova falls in love with his muse, the beautiful princess at court, Paradjanov introduces interludes of masque and mime artistry as a couple perform a dancing courtship, disappearing and reappearing among hanging woven rugs. The poet’s death is portrayed through a long sequence of allegories: chained workers scything hay; a blindfolded man stumbling through a bleak landscape populated by dancing angels; a swinging pendulum that knocks his childhood self to the ground; the poet laid with arms outstretched among glowing candles as white chickens fall around him. The unique poetry and symbolism of these images can leave the viewer a little disorientated at times – especially those unfamiliar with the traditional culture of the Caucasus – but the opacity somehow adds to the mystery and majesty; and on repeated viewings, the recurring motifs reveal the inner logic of the film and the way that early experiences influenced the elder poet. The colourful woollen yarn, the chaotic farm animals, the literature and the music of his youth informed his artistic conception of the world (‘From the colours and aromas of this world, my childhood made a poet’s lyre and offered it to me’). 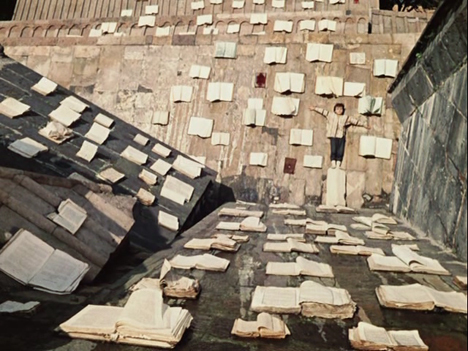 Sayat Nova’s death scene among the chickens perfectly recalls an exquisitely beautiful scene from earlier in the film, when the child poet lies down on a monastery roof, surrounded by books, pages rustling in the wind, his arms outstretched and staring up at the sky. Laden with the poet’s suffering and biblical and folkloric symbolism, there is an epic, earnest solemnity to The Colour of Pomegranates; and while such gravity and careful construction could lead to austerity and artificiality, there is also a consuming warmth and sensuality. His effervescent and corporeal sensibility mirrors Pasolini and Fellini more closely than his other mentor, Tarkovsky. The extraordinarily striking actress Sofiko Chiaureli plays the part of both poet and muse, exploring male and female sexuality (Paradjanov was himself bisexual and first imprisoned for a homosexual act with a KGB officer) and the film is joyously abundant with melodic folk music and heightened sounds: the crinkling of books’ pages; the squelch of pomegranate seeds; the dripping of wool dye onto metallic plates; the urgent chirping of bird song. There is almost no dialogue in the film; instead these sounds, intertitles displaying lines from Sayat Nova’s poems and the occasional voice-over convey the message. The Colour of Pomegranates is an emotionally affecting film and is especially poignant given Paradjanov’s own suffering in prison and the loss of his first wife, who was murdered by her own family after converting from Islam to Christianity. Lost loves and issues of ethnicity, subjects raw to his heart, are treated with immense compassion. And yet, The Colour of Pomegranates is also a film that joyously arouses all the senses: a truly sensory experience without precedent or successor. Paradjanov once said, ‘whoever tries to imitate me is lost’. Given the unique, mystifying, enigmatic visions he sets before the viewer, imitation would be frankly impossible. Previous PostLife during Wartime: Interview with Todd SolondzNext PostHeavy Rain: Game? Film? Art?